When Suzuki created the fuel injected bikes they programmed the Electronic Control Unit (ECU) to retard the ignition timing in the first 3 gears. This goes for GSXR 600s, 750s & 1000s, TLRs, and Hayabusas. I have heard several theories about why they did this. One is that they wanted to limit the power if a squid grabbed a handfull of throttle. Another says they did it for better emissions. Whatever the reason they did it. Some genius figured out that if you fool the ECU into thinking that it is in a higher gear than third you could eliminate the timing retard. Presto!! the TRE was born. Several manufacturers make these. You will hear them called Ivan's TRE, G-Pack, or JSD. The Ivan's and G-Pack are way overpriced if you ask me. The JSD, sold by Jeff Wallace on Gixxer.com, comes in a switchable or non-switchable form both for a reasonable price. That's if you don't want to do it yourself. The ECU gets a signal from a sensor on the bike called the Gear Position Switch (GPS) Each gear has a resistance associated with it. The ECU sees the voltage drop across the resistance and determines when to retard the bikes ignition based on the voltage drop. The Resistances and Voltages are approximated below. hair extensions">uk hair extensions the long hair micro-hair ponytail, with motorcycle jacket and sunglasses, handsome. Making a TRE by yourself is not that hard, even for the most electronically challenged (well maybe for the most challenged people). I recommend the Switchable TRE for the following reasons: With the TRE installed the bike will idle at a lower RPM than normal. On Cooler mornings this can make for rough warm ups. Also if you want to see if it made a difference it is nice to be able to switch back and forth. I did the switchable stock connector TRE. You can purchase just the connectors from Jeff Wallace, as well, at a very reasonable price. That is what I did. Jeff's wires are only 20'' long not long enough to reach my switch location plus it was fun to do and cheaper so I did it myself using stock connectors. So read on for Jim's TRE Installation instructions. Figure out where you are going to mount the switch. Measure the wires long enough to route from your switch location to the stock connectors and add about 2 feet for slop then cut. Wire up the switch using figure 2 above as a guide. For soldering tips click here. Start by bending the resistor so that both leads will slip into the switch's terminals. Leave a relief bend in each lead as shown at right. Now just connect the wires as shown above. I used Red for Pink, Green for Black/White, and Black for Blue. Check all of your connections using a ohmmeter on the other end of the wires. Wire resistance should be about .002 ohms. Label the wires as ECU or GPS appropriately at the other end of the wires, this will help later. Get out your Liquid tape and insulate the back of the switch. This will probably take a bunch of coats. I put 5 or 6 on. NO BARE SPOTS!! Keep in mind you will need to be able to mount the switch into the hole when you are done, so don't get any on the threads and don't make the finished insulation to large in diameter. (My switch was already mounted in the switch bar when I connected it). Once Insulated properly, Install the switch on the bike. Route the wires to the stock connectors. I routed mine along the wire bundle and it is difficult to tell they are even there. In Step 2 you cut the wires with about 2 feet of slop. After you have routed the wires where you want them to be, you can cut the slop out. Just make sure you have enough play for installation of the stock connectors later. Separate the wires that you labeled "ECU" earlier. We will work with those first. Double check that you have the correct wires by doing a resistance check. Connect your ohmmeter across those two wires and cycle the switch. Resistance should equal the Resistor in one switch position and open in the other. If not check the other wire pair. Once you are sure you have the wires that will connect to the ECU, get your male connector and associated hardware. You should have 3 spade pins (female) and 3 rubber seal rings (See fig. 8, the spade pin on the right is the female). Pull the wires out of the bike frame where you can work with them. Push a rubber sealing ring onto each of the wires including the blue substitute. Push the ring onto the wire far enough to get it out of your way. Carefully Strip about 3/8" of insulation from each of the wires. Then twist the wire strands. You might as well do this to all of the wires at this time including the blue substitute. Tin the stripped ends of the wires using your soldering iron and solder. Click here for soldering help. Once all the wires are stripped and tinned and the rubber seal rings are slid onto them like fig.10 you are ready to move on to the next step. Take the female spade pins and connect them, one at a time to the ECU wires. You may have to trim the tinned part of the wire a little. Connect the spades by folding the little metal wings around the insulation of the wire. Now solder each wire to it's respective pin. Don't use too much solder as the pin might not fit in the connector correctly. (The valuable tool in the picture is called a project holder available at radio shack for 5 to 7 dollars). Put a female spade pin on one end of the blue substitute wire now as well. THE NEXT PART IS IMPORTANT!! Now insert the spade pins in the correct orientation (fig 12.) into the stock male connector. They can only be inserted one way, so take a look prior to inserting them. Push them in until you hear a click. Push the rubber seal rings down into the holes around the wires to seal them. Not necessary, but I put a little hot glue over the holes to keep moisture out. Take the male spade pins and connect them, one at a time to the GPS wires. You may have to trim the tinned part of the wire a little. Connect the spades by folding the little metal wings around the insulation of the wire. Now solder each wire to it's respective pin. Don't use too much solder as the pin might not fit in the connector correctly. (If you have it use the project holder). Put a male spade pin on the other end of the blue substitute wire now as well. 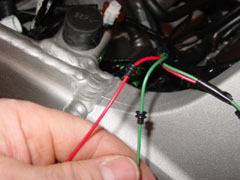 Determine the wire orientation of the male Stock connector on the bike. In other words, which wire goes in which connector hole. If this is screwed up the TRE will not work. Looking at the end of the connector the orientation should be like fig 15. Double check yours anyway. Now insert the spade pins in the correct orientation (fig 12.) into the stock female connector. They can only be inserted one way, so take a look prior to inserting them. Push them in until you hear a click. Now you are ready to disconnect the connectors on the bike. Use a small screwdriver or the like and get a second set of hands if you can. Push down on the tab with the screwdriver while your second set of hands works the connectors apart. It is easier with the gas tank off of the bike. Once the connectors are disconnected, Plug the homemade TRE into them Male to Female, Male to Female. Use some zip ties to hold it in place.